NHL ’94 enjoys a cult following, and is even hailed by some as the best hockey game ever made. For this third installment Electronic Arts brought in a new programmer, Mark Lesser, to develop the game. Lesser had previously worked in the industry designing handheld electronic games for Mattel including Auto Race, which was the first ever electronic handheld game of its type, and the better known Mattel Electronic Football. Lesser went on to program Frogger II: Threedeep for the Atari 2600 and the unreleased NES game Drac’s Night Out. After working as a programmer on John Madden Football ’93 for the Genesis, Electronic Arts tapped him to be the lead programmer for NHL ’94. The biggest improvement over the previous 2 games in the series is the addition of the one-timer shot, which really opens up the offensive game. This is a shot taken directly off of a pass, which when executed properly does not give the goalie the time to re-establish after the initial pass. The passing problems I experienced with the previous games also seem to have been cleared up, which helps keep the game moving along at a good pace. Other changes include the welcome removal of fights, removal of blood gushing from injured players, inclusion of 4-player support via a 4-player controller adapter, and reverse angle instant replays. The game also now includes penalty shots, but much like fighting in previous games, they happen too often and at the wrong times. An interesting and lesser-known fact is that EA actually worked with the organist for the San Jose Sharks, Dieter Ruehle, to add more authentic organ music to the game. Ruehle obviously watched a lot of hockey and as an organ player himself paid particular attention to it in other games, so much so that he knew the organ music for every team in the league. He knew not just what songs were played in different arenas but when they were played, and provided this to EA so that the game would feel more authentic to die hard fans of any particular team. Unfortunately the same issues with the AI largely still exist, and skating still feels unrealistic and cumbersome compared to more recent hockey games. After playing both this and the previous two games, I find that my left thumb hurts from my pushing the d-pad around so hard as I unconsciously try to force the players around the ice. Far from the best hockey game ever made, this isn’t even the best hockey game on the Genesis. But by the time EA got their stuff together for NHL 96 the Genesis had sort of lost its luster, so NHL ’94 ended up being the best hockey game to hail from the Genesis’ golden years. 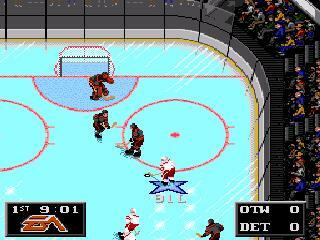 That being said, it was definitely the best hockey game available for any game system when it was released in 1993. Buy NHL ’94 on GameGavel or Amazon. Tagged genesis, Hockey, NHL '94, Review, sega, Sports. Bookmark the permalink.